The Office of the North Yorkshire Police, Fire and Crime Commissioner is one of the most nimble and efficient in the country. Your Police, Fire and Crime Commissioner (PFCC), Julia Mulligan, runs a tight ship as she is very aware that you demand for value for money. She also believes that Police and Crime Commissioners could and should be more efficient and less expensive than the Police Authorities they replaced. Julia reduced her budget (which carried over from the North Yorkshire Police Authority) from £1,080,000 to £911,000 – and saved more than £500,000 over her first term in office, compared to the old organisation. 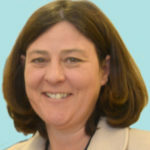 Almost uniquely, Julia’s Chief Executive Officer (CEO) undertakes their statutory role and works on core North Yorkshire policing functions. This gives the taxpayer great cost efficiencies and also ensures that, through her team, the PFCC is best placed to fulfil her duties and key objectives. Julia’s Chief Finance Officer (CFO) is employed on a part-time basis, making the role as economical as possible and, as the CFO and deputy CEO for the Cleveland PCC, comes with a wealth of experience. When you contact an OPFCC member, they will always get back to you as soon as possible and also aim to acknowledge all communications within two working days. If you do not receive a response within this period, please let us know. The deputy can exercise almost any function of a Commissioner except fundamental duties, such as appointing and, where necessary, dismissing the Chief Constable; issuing a Police and Crime Plan; or attending a panel in their place. 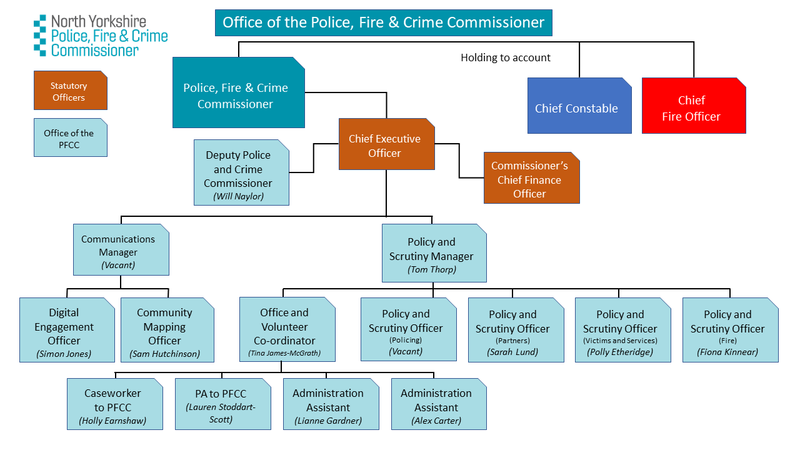 The deputy is considered a member of a Police, Fire and Crime Commissioner’s staff but is the only post that is not politically restricted – and they can carry out political activity on behalf of the Commissioner. All other staff may not and are bound by strict local government laws. Every PFCC must have a CEO, who is the ‘head of paid service’ and also the ‘monitoring officer’ that warns them about any actual or potential law breaking or anything else that might lead to an injustice. Currently, there is an acting CEO at North Yorkshire OPFCC, working one day a week. Dividing their time between here and West Yorkshire OPCC. The CEO works with Julia to deliver her vision, strategy and identified priorities – ensuring that her office is led effectively and maintaining close day-to-day links with senior police officers and staff. Both of these roles are undertaken by Chief Finance Officer, Michael Porter. The Chief Finance Officer (CFO) helps the leadership team fund, develop and deliver strategic objectives sustainably and in the public interest. The CFO promotes and ensures excellent financial management, safeguarding at all times public money – which is used appropriately, economically, efficiently and effectively. They have similar legal duties and responsibilities to the chief executive and monitoring officer regarding any unlawful (or potentially unlawful) spending by the PFCC or those acting on her behalf. Has a legal entitlement to the staff, accommodation and other resources needed to carry out her duties.